We've known Brian for some time and it was just great to finally be able to work with him. He's got this twisted mind, one that sometimes we wished we had when we're coming up with new stories, and it was nice to get inside his twisted mind for a while and draw this story. Now, the book is out. Check the link here and look for it on your comic book store. There's a great selection of crime fiction in it from a all star list of creators. I'm a suspect, for I love all of Diana's anthology projects, but this one is a killer. Sugarshock is out today is fine comic book stores across the country. Finally, the story in an awesome "all in one" package, with tons of sketches, pencils and concept art. You can't miss it this time around. And, if you think you still didn't have enough, some of the originals for the pages are still available for sale at the Beguling, including the cover for the one-shot, which I think I did a pretty awesome job (it definetly makes me want to do more covers). Now that we're done with the artwork from BPRD 1947,we're only working on Daytripper. It's great to work on only one project at a time. Specially when it's your story. Your art. Your baby. Let's hope you love it too when it hits. While traveling through idyllic rural Brazil, Bras and his best friend Jorge are having the time of their lives. Staring nature in the eye, learning more about the local people and customs – life is good and the future is bright. But when Bras meets the incredibly sultry Olinda, suddenly nothing is so certain anymore. Continuing the highly anticipated, rich new series from Eisner Award winners Gabriel Bá and Fábio Moon! Lovely interview on A Comicbook Orange! Awesome Casey McKinnon interviewed us during this year's San Diego Comic Con. Here's the treat! At our last day at the brazilian festival, after a night of heavy partying at the rock bar, we discovered that I WON AN HARVEY AWARD for best artist yesterday.There's no better way to celebrate it than to have your friends with you, and there are not anyone we want to tell this more than our fans. Thanks for being here and supporting our books. This week, we're busy (when are we not?). Bá is working on the third Daytripper cover, I'm drawing interior pages and we're getting ready for FIQ, a festival that happens in Belo Horizonte every two years. Ivan Brandon, Craig Thompson and Ben Templesmith are some of the guests this year besides us. Also, we're releasing the brazilian edition of The Umbrella Academy this week, and also the brazilian edition of PIXU. Vasilis and Becky are coming for the party, and they're staying so we can cook something up while we're here. I hope that, before the end of the year, we'll have plenty of news to share of the possible future projects, but right now we're very excited with the projects we're currently working on, and we just want to focus on making Daytripper as great as we think it can be. 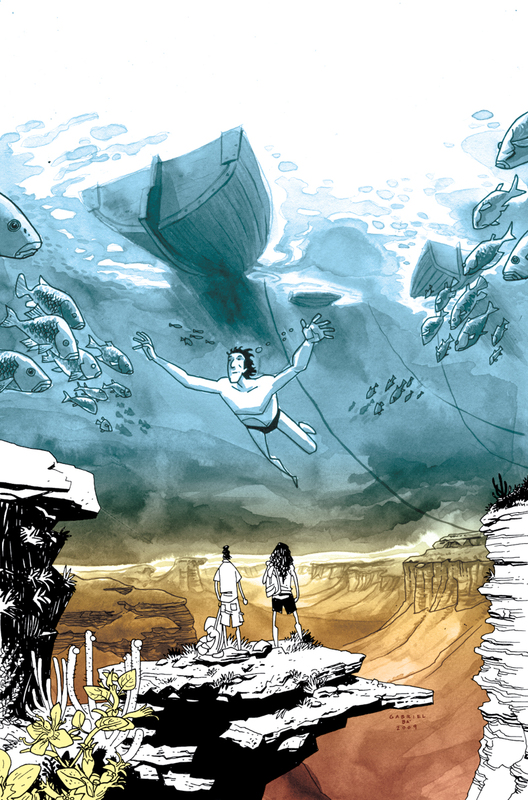 From now until December, make sure you make your retailer order Daytripper, 'cause you won't want to miss on this ride. Two issues left on BPRD 1947 for the readers, so that's probably the Moon/Bá art fix until Daytripper hits. And the end of BPRD is totally worth it. It's AWESOME! Don't miss it.